Black Joe Lewis: Party Music Isn't High Art Though he shouts and wails like a soul man, Joe Lewis drools and gums his words so unintelligibly you'll be lucky to catch one in five. The band rocks with James Brown-inspired grooves, but Lewis sings with enough conviction that you want to know what he's saying. This week, some 1,800 music acts will descend on Austin, Texas, from all over the world for the South by Southwest music festival. 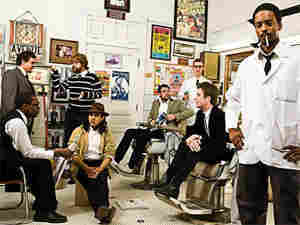 One band that won't have to go anywhere is Austin's own Black Joe Lewis & the Honeybears. Joe Lewis learned to play guitar working at a pawn shop, but nowadays he's in the fish delivery business. The band's rhythm guitarist, Zach Ernst, is a substitute teacher. Ernest says, "I think everyone would, of course, rather be playing music, but we've got a real big band and a lot of mouths to feed and bills to pay, so we all kind of have our own job when we come back home." Rock 'n' roll isn't all sequins and room service, but things are looking up for Black Joe Lewis and the Honeybears. They already have a big local following in Austin, and this week — timed to the release of their first CD, Tell 'Em What Your Name Is — the band gets to strut its stuff in front of the world's music industry bigwigs at the SXSW music festival. Black Joe Lewis used to front a Chicago-style electric blues trio, and his blues-influenced guitar playing is still very much in evidence. But the Honeybears have added horns to the mix and a funky soul sound that's spiced up with a little garage rock attitude. Put it all together and you've got a perfect band to get a sweaty, rowdy, crowded bar bouncing to the beat. This is party music, and the Honeybears don't try to turn the process into high art. "If I say something cool and it sticks, that's pretty much the song, you know," Lewis says. But there is one serious-minded tune on the album: "Master Sold My Baby." "I wrote that song about the slave that comes into port — you know, they used to split the families up and all that," Lewis says. "So it's the slave that wakes up and they sold his wife or whatever the day before, and he's just trying to see where she went." Most of the time, I don't know what the hell Joe Lewis is saying. Though he shouts and wails like a soul man, he drools and gums his words so unintelligibly you'll be lucky to catch one in five. Yes, the band rocks without clearly enunciated lyrics, but Lewis sings with enough conviction that I want to know what he's saying. At 10 songs and barely more than 30 minutes, Tell 'Em What Your Name Is gets right to it. The band is all over these James Brown and Otis Redding grooves with a loose, bubbling intensity. The production, handled by Spoon's drummer, Jim Eno, is spot on, mixing just the right amount of space and clarity for the instruments with a '60s mono, barroom blues ambiance. So if you've got some boogying to do, Black Joe Lewis & the Honeybears will get your party started.